What about people? What about you? Would people say you are a hard person? Why? Been burnt by life or were you just raised or born that way? What about people that are too wiggly…and you can’t really depend upon them for anything? So what kind of hard and soft are you talking about, Joe? Is there really a spiritual soft and hard? Oh, I think so, but not to man’s will and jive, but to God’s will and truth. So what does it mean to be soft or hard to God? What does this look like? I mean, really, deep down. Is it scary to be soft to God and his will? Is it scary NOT to be soft to God’s presence, truth and will? Bottom line…just because someone is Pharaoh-like hard, really means nothing. Our job is to be obedient. God will do the breaking in his time. In the end, as I often say, you can bend, break or distort the truth. Oh you may think you can for a moment…or Satan’s great lie…but in the end, the truth always, always, always breaks you. So you can submit to it early and live, or submit late and be crushed. The choice is yours…pay God now or pay him later, but make no mistake about it, everyone pays. Why? Because you can’t change the truth. The truth is the truth, is the truth. Submit and live or submit and die, but the truth never ever changes. So let me ask you a question: if you are packed too tight, how is God’s Spirit going to get inside and work his miracles inside your mind, heart and soul? You might want to consider loosening up a bit, that is, if you are too tightly-packed. The God of the universe has plucked YOU, out of all people, a wandering shepherd, to lead your entire nation numbering over two million people out of the country they are currently enslaved within, across a barren wasteland with little water or food resource to a land which only a few of their forefathers briefly occupied over four hundred years before and is currently occupied by inhabitants who have no intention of giving it up. Impossible you say? Ridiculous? Sounds like it to me, unless the God of creation is the one doing the calling and doing the work. Do you have the guts to be obedient no matter what…no matter the price? 14 Then the LORD said to Moses, “Pharaoh’s heart is unyielding; he refuses to let the people go. Why does I AM say this to Moses? Is this not obvious to Moses already? He is just reaffirming to Moses what he already said he would do to Pharaoh? In other words, God is hardening Pharaoh’s heart. 16 Then say to him, `The LORD, the God of the Hebrews, has sent me to say to you: Let my people go, so that they may worship me in the desert. But until now you have not listened. Where does the word “Hebrew” come from? Why not Israel after Jacob whose name was changed to Israel by God? You will know that I am I AM or Yahweh—in other words, I am he…who is doing these great works. Certainly not one of your gods. How does water change to blood? Did something die in the river? Something upstream? Was it really blood? Did God change water molecules into blood? But blood contains water. All water everywhere is turning to blood. This can’t just be something upstream. And Aaron is the one stretching out his hand. Truly Moses is acting like God to Pharaoh. 22 But the Egyptian magicians did the same things by their secret arts, and Pharaoh’s heart became hard; he would not listen to Moses and Aaron, just as the LORD had said. How did Magicians do the same thing? Was theirs a trick? An illusion? I have known some people this hard. Well here is where they found water. Note: here are some modern-day occurrences of rivers and bodies of water turning mysteriously red. 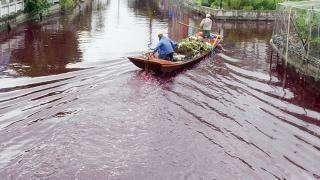 A river in eastern China turned blood red overnight and investigators aren’t completely sure why. Residents living in Wenzhou, a commercial city in the Zhejiang Province, saw the river change to crimson Thursday morning, China Radio International reports. People told CRI the river was flowing normally at 4 a.m. but rapidly turned a scary shade of red at about 6 a.m. A villager who has lived there his entire life said he’d never seen the river turn red before. ABC News reported that residents also experienced a strange smell in the air as the river changed color. After investigating the incident, the Wenzhou Environmental Protection Bureau told Voice of America that they were unable to figure out the cause of the river’s change in hue. Investigators said they didn’t find anything suspicious coming from the factories along the river. One theory from the bureau was that someone dumped artificial coloring in the water, believing heavy rains from Typhoon Matmo would wash away the red dye, China News reported. But the Typhoon did not dump heavy rain on the area as some expected, so the river became “bloodied,” according to that theory. • 14-19 God instructs Moses and Aaron to go before Pharaoh as he goes down to the river, confront him once again with his refusal to let God’s people leave to go into the desert to worship God and then stretch out the staff and turn the river into blood. And everywhere water will turn to blood. • 20-21 Moses and Aaron do this; the water turns to blood, the fish die, the river stinks and people can’t drink any of its water. • 22-25 But because Pharaoh’s heart was hard and his magicians were able to reproduce this feat in some fashion, Pharaoh was not moved to do anything but return to his palace and so for seven days, the Egyptians had to dig along the river for water. Pharaoh is unmoved even when Moses and Aaron turn the Nile and all its water into blood for seven days. Why’s? Why did God include this passage in his timeless word? Or What do I learn about God? Life? People? Myself? • God knows what is going on; he is not a distant God, as the Deists would have us to believe. Deists, such as Benjamin Franklin and Thomas Jefferson, believed that while God started it all, he has left it up to us to do everything else. In other words, we worship a distant, detached God. This story does not suggest that in the least. God knows what is going on and is involved. • And yet God still commands us into battle, and we are not always supposed to win immediately. • Man attempts to imitate God’s power. • A hard heart can be very hard. 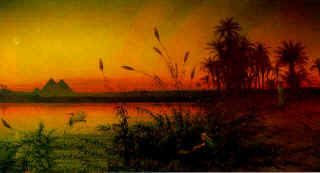 • God can do anything, and sometimes uses people to accomplish his marvelous feats, such as turning the Nile into blood. • God is not afraid to use pain to discipline or get the attention of man, and again sometimes, despite all this pain, man still does not get it. We can be very very stubborn hard-hearted creatures. So What’s? How does this truth personally apply to one of my life’s struggles? Struggle…Have been under the weather this week. I think a cold or something–carried over from last weekend, I suppose. Have tried to rest the last couple of days. Slept a lot today. Very cold at times. Freezing. But better at the moment. We will see tomorrow. Tomorrow is picture and parent’s night for the basketball team. Rhonda and I have to work the concession stand. I would love to see the varsity game against the fourth ranked team in the state (Branson lost by one several weeks ago to the same team), and I don’t mind manning the concession stand. But I have zero desire to do the picture or the introduction thing. But I guess it is something you have to do. It all starts a 4:30, so I fear the long evening. I don’t really want to relapse. I know how tough this stuff can be to kick. Still I haven’t been sick for a very long time, so I have been very fortunate. I also have the Sunday off teaching-wise. Not sure what I am going to do. I am trying to break up my teaching, so that I don’t get burned out in the preparation phase. I was not pleased with last week’s teaching. Got a real late start. Again I wasn’t feeling very well. Very drained or tired. Assume it is just a virus or cold I am battling. 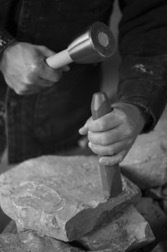 Principle or Truth… I want to focus on the hardness of people’s hearts. Application…After having dealt with those that left our fellowship so many years ago, I think I was very naïve to just how hard or unreceptive people are to facing or dealing with the truth. It is a delicate art. I dealt with one couple recently. After only five or six weeks of marriage, the wife, who claims to be a strong Christian, seemed to be asking for a divorce. She felt her new husband had conned her about the amount of debt he had incurred. And while to a certain degree this was true, I did not feel it justified an early divorce. When I confronted her, she got up out of her seat and stormed out of my office screaming divorce! There was no calming her down. She was hard. Very hard. I see so many of our friends and family members and think what does it take to get inside their hearts and minds? But wounded by painful past experiences, guilt, shame, lies, misbeliefs and misunderstandings, they tend to construct thick walls of emotional, theological, spiritual and intellectual protection that not only attempt to shield them from life’s pain, but ends of shielding them from the truth as well. It’s called denial. Jesus said in Rev 3, that to anyone having the courage to unlock the door, I stand at that door knocking and I will come in and eat with him and he with me. Unlocking that door requires humility, brokenness and vulnerability. It requires trust, and, unfortunately, when someone feels that they have so much to lose, such as Pharaoh, unlocking that door and allowing the Supernatural God of the Universe to come in and clean up my heart, soul and mind, can be a very threatening thing apparently—I don’t want to be hurt again, and in so doing, I become my own flawed god or I bow to the gods of both deception and self-deception. So how do I apply the lesson of the “blood” here? Because people’s hearts are hard for whatever reason, we should EXPECT initial rejection. But that doesn’t mean that God does not know what is going on or that I am to stop trying. On the contrary, I am to persevere. So therefore, I will be patient with my family, others in the Body of Christ, and with our family and friends. But we never stop knocking. We never stop praying. Because you never know, as, no doubt, many of you in the Body can attest. 2014 Update…It’s been twenty years since this all began…and not much has really changed. Incredible. Apparently, people can be hard for long periods of time. Learn from me, people. No one told me about this kind of stuff. My life has become a life lesson in all of this, and so my story continues, but so does God’s plan, and in the end, he will triumph. Thanks…for some financial relief. Thanks, Lord. It’s been a whirlwind of a past month in attempting to minister to a spiritual daughter—I suppose she is spiritual. I am really not even sure of that. Lots of ups and downs…lots of lies, deception and little staying power. Lots of learning too—learning just how a person on drugs or addicted to opiates lives day-to-day, like an animal, not knowing where they will sleep next or where their next meal will come from. Constantly using anybody, anytime, anywhere to get to their next momentary spot of perceived safety. Now I know this doesn’t sound like much of a praise, but I have learned tons…or as Shawn coined my most recent teachings in John 13…love gets dirty…in washing dirty feet…made dirty by walking and living a somewhat dirty world. There is no other way around it, and as much as we wish it could be easier, and at times, via God’s Spirit nudging us up life’s learning curve, it does get easier. But there are a lot of feet and a lot of dirt out there, thus a lot of constant foot-washing that needs to be done. So, instead of just teaching about it, I have been honored with the gift of living it. Love gets dirty. I am so thankful that Love got dirty and died to atone or pay for my filth, is it too much to ask to get dirty, attempting to love or wash the feet of a wayward and pregnant prodigal? I think not. Struggle…It never changes it seems. Time. Time and managing it, or managing all that my eyes or mind perceives that needs or could be done. Oh, God you have been so gracious, be gracious again. And in the midst of all this time, please allow me to push through on writing a brief history on love and how, in the end, without God, man’s love…human love…can be a real pig. Truth…Despite the hardness, we never give up. One never knows when the hard will break…ten plauges, ending with wide spread death…twenty years..thirty years…even on one’s death bed…after tragedy or utter devastation and loss. What does it take to break a hard human heart? Only God. But with aid of his Spirit, wisely, powerfully, truthfully, appropriately, in the proper time and moment, with words from heaven, we deliver the message. That’s all we can do…that and pray. Application…For the moment, I have to let her go, even with that baby inside her womb. Oh, bring her back, God. Defeat sin and its entangled web of deception. Crush her. Crush her back to you. Oh and this baby…this baby girl….protect her, Lord. Protect her from the person who seems unable to protect her. This is life, Lord. I place this unborn infant and her lost mother in your hands. And Lord, I pray, please keep my spiritual heart muscle supple to your will, presence, truth and power. Despite, the pain, the loss, the rejection, the hurt, the frustration, the disappointment, the lost dreams, do not allow my spiritual arteries to become clogged or choked. Lay your hands upon my heart and press down. May our hearts beat as one. May your Spirit’s presence race through my spiritual arteries, bringing my body your life-giving love, truth and hope. What about you? Struggle? Truth? Application? What about your students? Their struggles (list a few; think about several of your students)? Scripture quotations, unless noted otherwise, are taken from the Holy Bible: New International Version‚ NIV‚ Copyright 1973, 1978, 1984, International Bible Society. Used by permission of Zondervan Bible Publishers. All rights reserved. This entry was posted in Learning Center Lessons and tagged hard, Moses, truth on November 1, 2014 by admin. I don’t understand how Pharaoh could simlpy turn his back on his people by denying them of water. Water is life. If he thought his magicians had the same power as God, then he should’ve made them turn all the blood back to water, not turn a bowl of water into blood (or whatever small vessel of leftover water there was). He truly was a proud and selfish man to see his people suffer thru all those plagues and not be affected as long as he was OK in his grand palace.